When should the Wartner Corn Pen NOT be used? On children under the age of four. If you are not certain that the skin condition you are treating is a corn or persistent callus. Consult a doctor if you are diabetic. Consult a doctor if you are pregnant or breast-feeding. What are the components of the Wartner Corn Pen? The Wartner Corn Pen contains a gel formulation based on trichloroacetic acid (TCA). It comes with a easy to use pen applicator with a twist-and-turn mechanism to dispense the correct amount of gel to be applied on the corn (or callus). Is the Wartner Corn & Callus Pen difficult to use? No. The Wartner Corn Pen should be used with precision, but it’s not difficult. The information leaflet explains exactly how you should use the Wartner Corn Pen. How do I use Wartner Corn & Callus Pen? 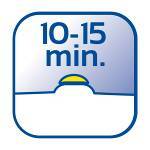 Let the gel dry for 10-15 minutes before putting on clothes or shoes. The Wartner Corn & Callus Pen formula is very concentrated and only one drop is needed per application. Carefully cover the entire surface of the corn or callus and not the healthy skin surrounding it. Once the treatment is completed, carefully clean the pen with a tissue before storage. How often may I use the Wartner Corn & Callus Removal Pen? The Wartner Corn & Callus Pen should be applied once daily for 4 days. After this treatment of 4 days, the skin will peel off over the next 4 days. You can carefully remove the peeling skin under lukewarm water. After the treatment, new skin (free from corns or calluses) will form. You can repeat this treatment schedule up to 4 times. Is it dangerous to use the Wartner Corn Pen to treat children under four? We do not recommend the use of Wartner Corn Pen to treat children under the age of four. Can the Wartner Corn & Callus Pen be used by pregnant women? Yes, the Wartner Corn Pen can be used by pregnant and breast-feeding women. However, consult a doctor before use. Can the Wartner Corn & Callus Pen be used to treat children? The Wartner Corn Pen is suitable for children over the age of four. Can I let the area treated get wet? Yes. You can shower and swim after treatment with the Wartner Corn & Callus Pen. Who manufactures the Wartner Corn & Callus Pen? The Wartner Corn & Caluus Pen is manufactured by medical brands, Veembroederhof 96, 1019 HC Amsterdam, the Netherlands. Where can I buy the Wartner Corn & Callus Pen? 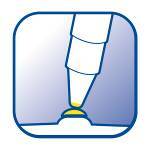 You can buy the Wartner Corn & Callus Pen at your local pharmacy, Chemist or Grocer. What is a corn or persistent callus? A callus (or callosity) is an especially toughened area of the skin which has become relatively thick and hard in response to repeated friction, pressure, or other irritation. A medical device is typically a product that works on or inside the human body, delivering either temporary or permanent impact, and is aimed at prevention, diagnosis, monitoring or treatment of diseases. The key difference versus traditional medicines is that a medical device primarily works mechanically as opposed to pharmacologically, i.e. it works alongside or with your body versus affecting chemistry of the human cells. In general medical devices are used for alleviating and treating severe and chronic diseases of the heart, brain, bladder, digestive tract etc. with superior efficacy to traditional treatments using chemical molecules. This is because they typically work directly where your body needs help. How is it different to the Wartner Verruca & Wart Removal Pen? Lower concentration of TCA gel: The Corn & Callus Pen contains TCA gel of less concentration compared to the Verruca & Wart Pen. The TCA gel induces a peeling of the skin. As this occurs, the thickened skin or corn will disappear and new healthy skin will form. In a pilot study, 85% of people assessed had complete removal of their corn or callus in just 1 week, clearly indicating that visible results are seen within the first treatment period of 4 days. Medical devices for prevention and treatment of diseases are typically as or more effective than traditional medicines, because they work directly on the root cause and/or location of the problem. For example medical devices are used nowadays to provide relief to patients suffering from chronicle pain due to cancer.